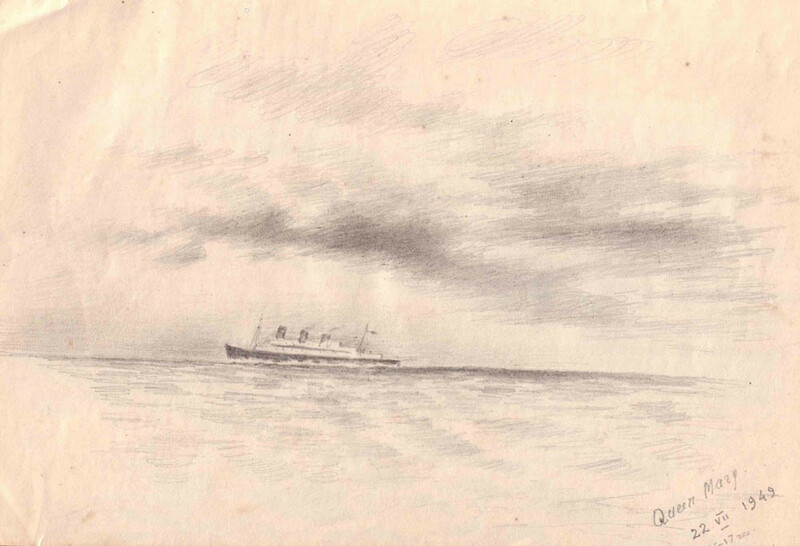 Pencil sketches of the Atlantic drawn by Eugene Kogevin during his trip to America on July 19 - 29, 1949 aboard U.S.S. General C.H. Muir. 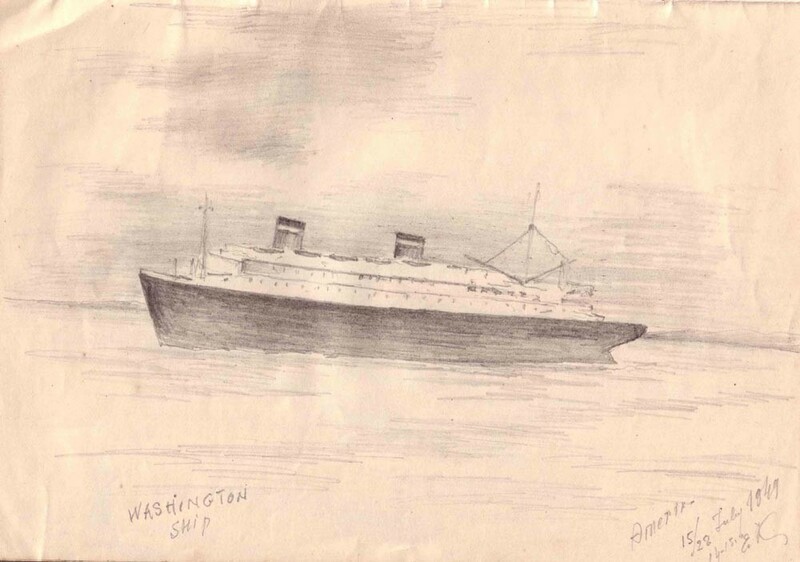 Below is an invaluable piece of evidence by a passenger of U.S.S. Gen. C.H.Muir who was aboard the ship with Eugene and Raissa Kogevin. They didn't know each other and have never met since then. The trip from Austria and across southern Germany was through the Alps. Traveling mostly at night, we couldn't see the terrain, but the strained ascent and almost free-fall descent was proof that the mountains were substantial. The first few peaks had me clutching my seat. I thought the train would uncouple and hurl us backwards into the valley; after cresting the peak, it felt like the whole train would fly off the rails on the way down. But after surviving a few of these ups and downs, we gained faith in the Austrian railroad. 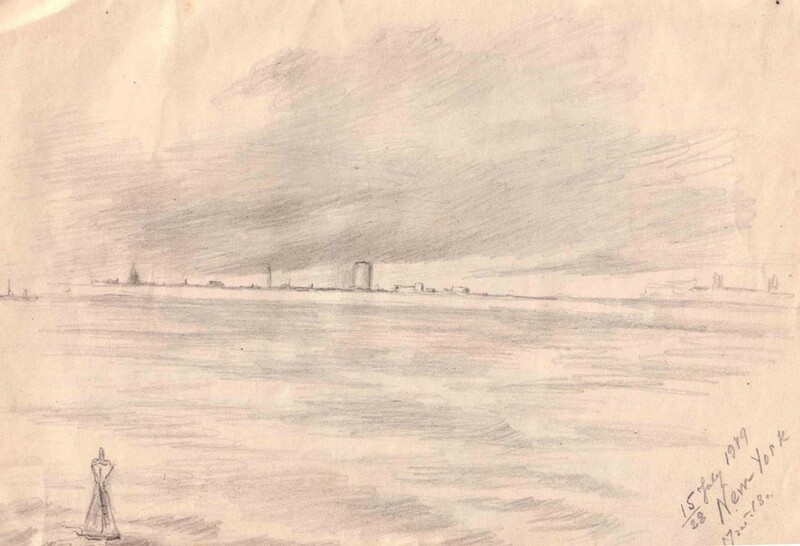 The next day we reached Bremen, a city near the North Sea coast of Germany, and found ourselves in another camp along with 1,214 other hopeful emigrants. We were checked out thoroughly. Passports, immunization, status of lice infestation, were all inspected as we stood in endless lines for each procedure. 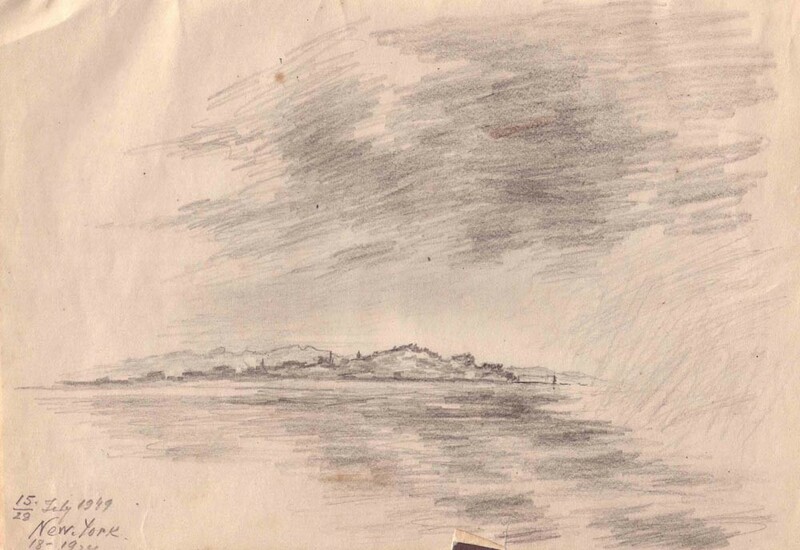 No one seemed to know just when we would sail, so the close of every day in this temporary camp was a disappointment. We were desperate to settle into a normal life after being displaced persons since 1943. 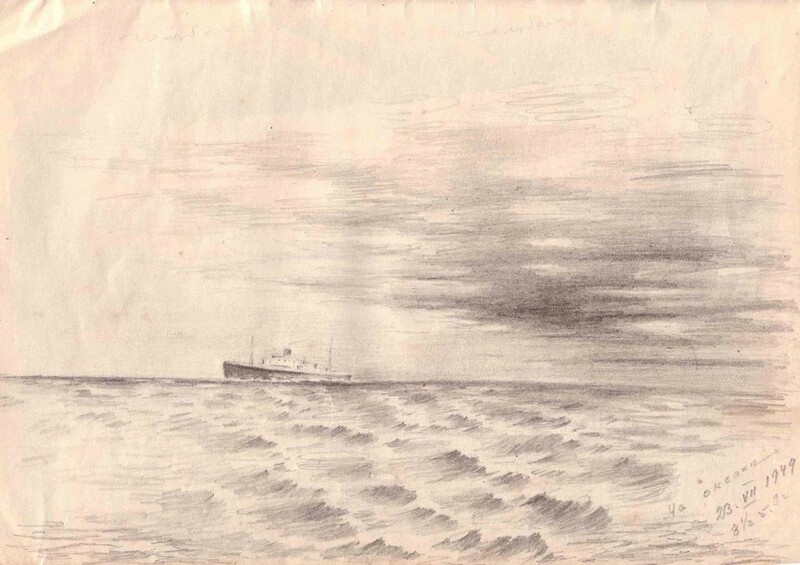 Getting across the ocean meant that the communists were not likely to pursue us. On July 19, 1949 we were loaded into military transport trucks and delivered to Bremerhaven, the port city, to the side of the U.S.S. 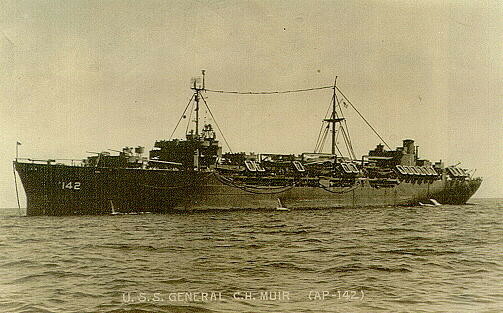 General Muir - a military transport ship. We were thrilled, except for mother. She broke into tears as the ship began to ease away from the dock. As long as we were on the European continent, she thought that we might have a chance of returning to Ukraine. But crossing the Atlantic in reverse would almost certainly not be possible for us. She was right. I felt sad for her. She quieted down as the German coast receded from view, and we carried our luggage down the metal stairs. 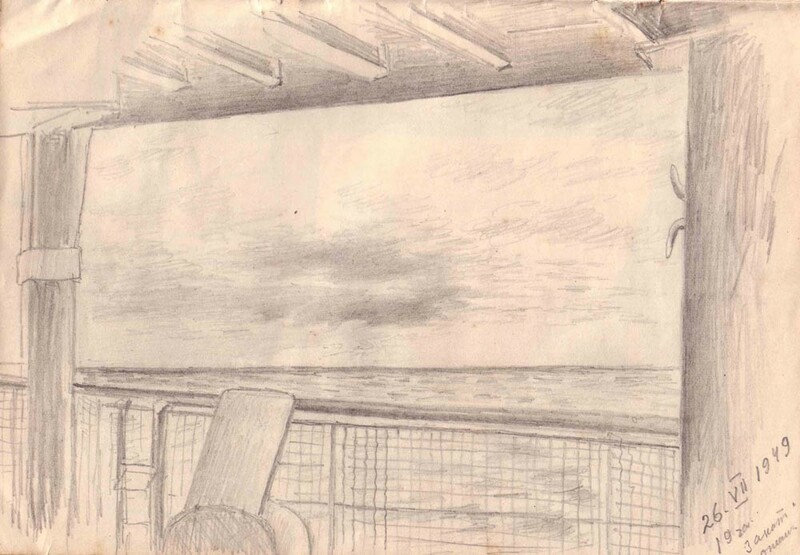 Except for father, we spent most of the ten days of the journey in a fetal position in some sheltered corner of the deck, controlling our urge to vomit while avoiding being stepped on by other passengers wobbling gingerly past us. 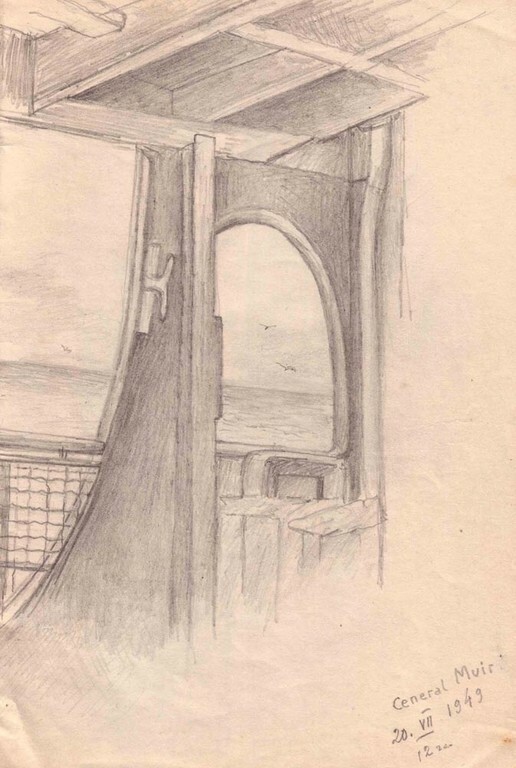 Along with hundreds of other females, mother and I were allotted bunks three decks below, more or less in the center of the ship. Several days into the trip, I was awakened by moans and screams of the other passengers. We were in a storm! The ship was in a pattern of heaving up and crashing down into the ocean, with occasional side rolls. From her bottom bunk mother tried to guess from which side I would fall. I could see her outstretched hands first on one side of the bunks, then the other. The trick was to not get dumped out of my topmost of three bunks. I looked across the room. The women were writhing, grasping the metal frames of their bunks, vomiting, moaning. Mother's lunges from side to side of the bunks were accompanied by agitated whispers, "Oy Bohzhe, Oy Bozhe" ("Oh God! Oh God"). Father and Vladimir were even worse off. They were in the bow of the ship, where the motion was much more pronounced. Not being prone to seasickness, my father took charge of family logistics. He cheerfully encouraged us to spend time in the fresh air and to eat. On about the second day he was asked to help out as a "greeter" at the entrance to the cafeteria where all our meals were served. He shepherded the passengers into the cafeteria and also passed on any announcements the ship's staff needed to disseminate. After each meal, father helped us up to the deck to our "fresh air spot". On one occasion, my stomach seemed particularly queasy after a meal. Father pushed and dragged me and finally slung me over his shoulder to carry me up the steel steps from the cafeteria to the deck. The sea was turbulent and threw surprise sprays of salt water over us. As I hung over his shoulder, I heard something crunch in his jacket pocket. When he finally nestled me into a dry corner on deck, he checked his pocket. "Oh, my God, my false teeth broke," he said, staring meditatively into the distance. 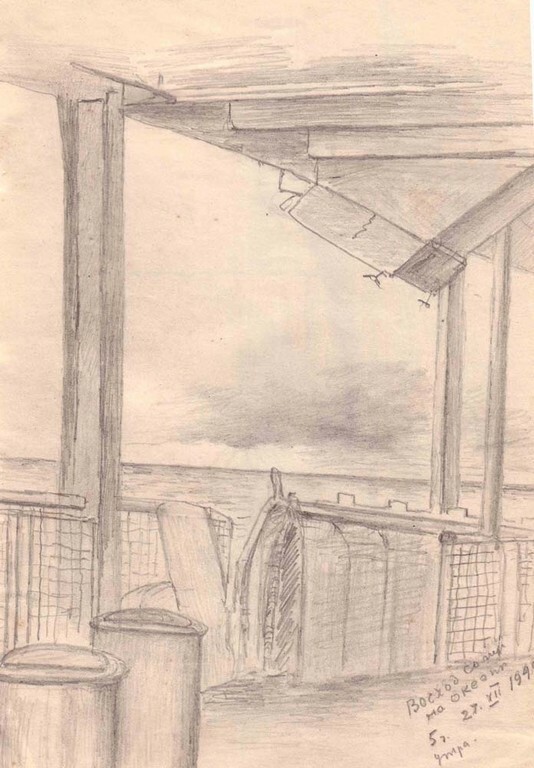 As we carefully descended the staircase from the deck to the cafeteria on another day, we saw our father proudly standing at the door with a large green stalk with ragged leaves in his jacket pocket. As the steamy aroma from the food line almost overwhelmed us (bad combination with rough seas), I asked him what that "thing" was in his pocket. Having never seen such a plant before, he had spotted it in a tray among the food and decided it was the American version of a boutonniere. He chuckled with pride! The impression he gave was that he was catching on fast to American ways. We had a good laugh about this when we saw celery in the vegetable section of a grocery store after our arrival in Newark, Delaware! 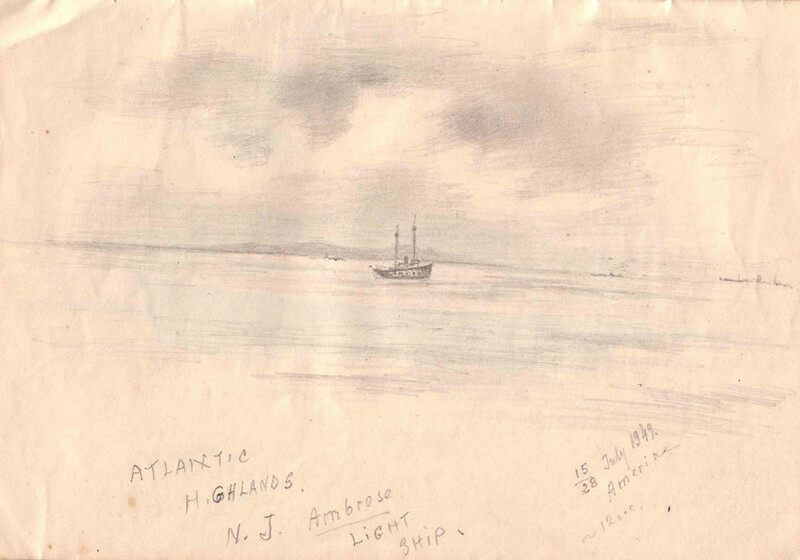 Except for father, we all stayed sick during the voyage until the wind and waves calmed down on about our last day on the Atlantic. The cool ocean breezes slowly turned into stifling puffs of moist heat as we approached the U.S. coast through a haze. The General Muir dropped anchor to wait until the next day, when we would disembark. The sun was setting over the glimmering lights of New York City and the New Jersey coast. Pink clouds were spread thinly above the skyline. Tiny sparkling lights shimmered in the windows of the skyscrapers. It was like magic! We had never seen a building higher than three stories before. "ESSO" signs caught our attention. "Ah," said my father, "that must be what Americans call their country." They want us to know that we have finally reached America." 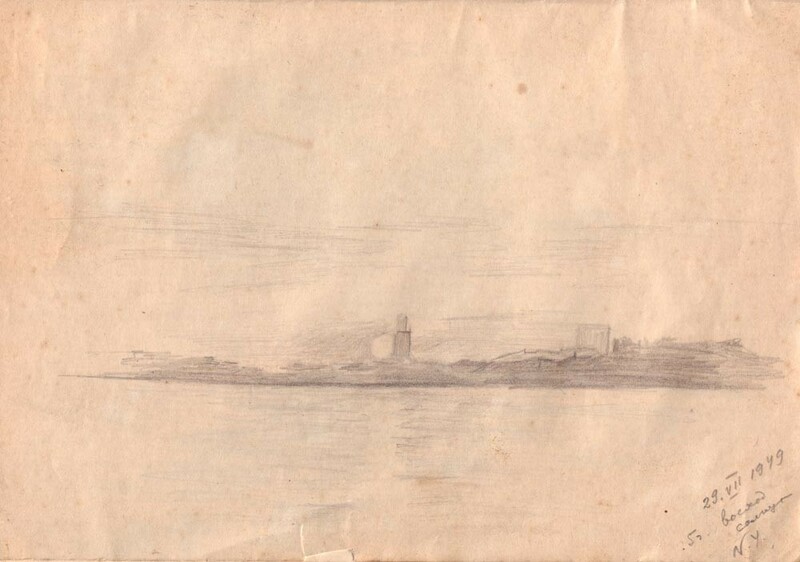 The next morning, July 29, the ship was towed to dockside. There was an apprehensive hush among the passengers. Mother and I hurriedly packed our suitcases and headed up to the deck, where father and Vladimir were already waiting for us. The heat was stifling. Carrying our modest suitcases, we shuffled toward the gangway, where all our documents were checked. Patiently, we descended to the dock and found the rest of our luggage - two wooden chests father crafted just before our trip. We had spent all our savings on quilts which filled the chests along with some ancestral embroideries we had carried with us from Ukraine through thick and thin. (Our philosophy was that, at least, the family wouldn't freeze to death in America, if we had quilts!) We found a spot on the edge of the dock and huddled around our luggage. Mobs of people jostled around us. Some were crying, hugging relatives who had come to meet them. Others were being whisked away in cars. Police were directing the flow of people, all burdened with suitcases and bags. English words flowed in continuous incomprehensible ribbons around us and off into the distance. The mass of humanity oozed off the dock gradually and melted into the city. By dusk, we were sitting alone on the dock. We had not been given any instructions beyond getting off the boat. Without the throng of people, we could hear water lapping up against the pilings of the dock, a murky echo of the ocean waves. With increasing darkness the shimmering city came into full focus. Cavernous dark holes outlined the tall sparkling buildings. We knew no one in America, so no one was picking us up. We just sat on the dock. Eventually, a police officer motioned us to clear out. Not knowing any English, my father just shrugged his shoulders. The officer disappeared. The excitement of having reached America began to feel like abandonment. Behind us the dark water continued to slap into the pilings and roll back underneath us. The policeman came back in a while with a social worker. She told me in German that we were not allowed to stay on the dock after dark. My father asked me to translate to her that we would be glad to get off the dock, but we had no place to go. She motioned us to come with her to a waiting car. We were whirled through Manhattan rush hour traffic and deposited in a small suite on the fifth floor of the Hotel Carteret. New experiences started to confront us. We saw carpets on the floor of our tiny suite - first time we had ever seen a carpet. Cushions on the sofa intrigued us. Why were they there when the springs under them were already so nice and soft? We had never seen uphostered furniture before. We experimented with the cushions and finally decided that they were meant to serve as a foot rest. We felt that we had acquired our second American habit! Across the street on a rooftop one story down from ours we saw a sign, "YMCA". We thought it was another Americanism, such as "ESSO". One day we saw an amazing action on the "Y" roof. Two men in white suits, face masks, and holding shields, started to jab each other with swords! I ran to father and reported breathlessly the impending bloodshed. Noticing the choreographed movements of the men, father decided they were fencing - he had heard of it. We were relieved and, at least the men in the family, watched the sport avidly whenever the fencers showed up. Our suite had no kitchen, so food had to be brought in or we had to eat out. First, we needed to find a bakery. We searched the streets, but spotted no bakery - there were no window displays showing round pumpernickel like we had seen in Austria. Mother finally said, "What a pity that there is no bread in America. The people here just don't know how tasty it is!" It was not until we got to Delaware that we realized that American bread was usually wrapped in paper. Eventually we managed to find a Horn and Hardart's, where food could be seen in little windows in the walls, and bought using coins. That was very handy for us, since I knew only one phrase in English: "Do you sell potatoes?" - with the stress was on "toes". (The rest of the family didn't even know that!) We sometimes got underfoot at H&H, not knowing the social courtesies in a crowded cafeteria. Once a lady became enraged at me because I started to put down my tray at an unoccupied space at her table. We were terrified, and had no idea why she was screaming full force at us. My mother was aghast. Everyone within earshot was staring at us. Not knowing how to apologize in English, we couldn't easily extricate ourselves. I had a knot in my stomach. We got away from the screaming lady and found places at another table for all of us. Later we figured out that the lady was trying to tell us the spaces at her table were saved for companions, but we didn't understand, of course. After that, we tried to lie very low, so we wouldn't create any more frightening scenes. 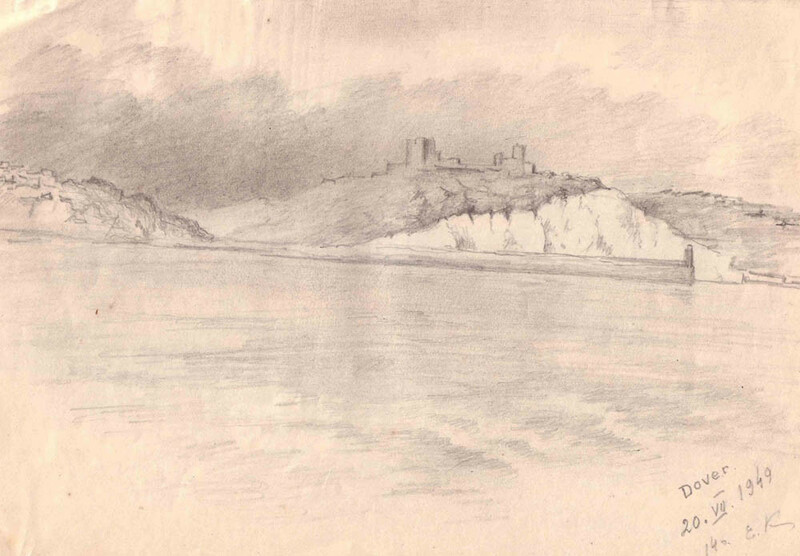 To our surprise, on the fifth day of our stay in the Carteret, there was a knock on the door. We cracked it open and saw a slender man of medium height and ruddy complexion, dressed in a white linen suit. He raised his straw Panama hat, and bowed slightly to us all as we bunched up in the partially open doorway. In a heavy German accent, he said, "My name is Otto Drobeck (Mr. D.), and you will come with me." (We later found out that the social worker had advertised father in the N.Y. Times as an available worker with wife and two children.) The rest of the conversation proceeded in German. We quickly packed up our things and followed Mr D. out of the building. A taxi took us to a train station from which we traveled to Wilmington, Delaware. From there, we rode in Mr. Drobeck's Pontiac. We had never ridden in a sedan before, and felt almost royal. Gradually, the congestion of buildings in the center of Wilmington gave way to fewer buildings and more greenery. Finally we reached the countryside. The air became clean, the heat subsided. A rain shower began to fall. Leaves rustled on the trees, as we rattled over the wooden planks of Thompson Station Bridge. I craned my neck to look at the bubbles formed by the big raindrops in the dammed up water of White Clay Creek, our future swimming hole. Less than a mile up a slight hill, we pulled into the driveway of Mr. D's house on Chambers' Rocks Farm. Gertrude Drobeck ( Mrs. D) came out to greet us accompanied by their dog Kango. Later that day we met their son, Klaus, a veteran of the War in the Japanese theater. His military career over, he was a student at the U. of Delaware. He was working on the farm for the summer. Our father worked as a farmhand on the farm, while mother helped Mrs. D with the household and gardening. Not being used to such a large house, mother got lost in it once, and we had to rescue her! We all had a big laugh about that! We felt very safe with the Drobecks from that day on. As the crow flies, the farm was about four miles from Newark, the nearest town and the home of the University of Delaware, where Vladimir and I eventually studied. Some years later, I met my husband Bob on its campus. 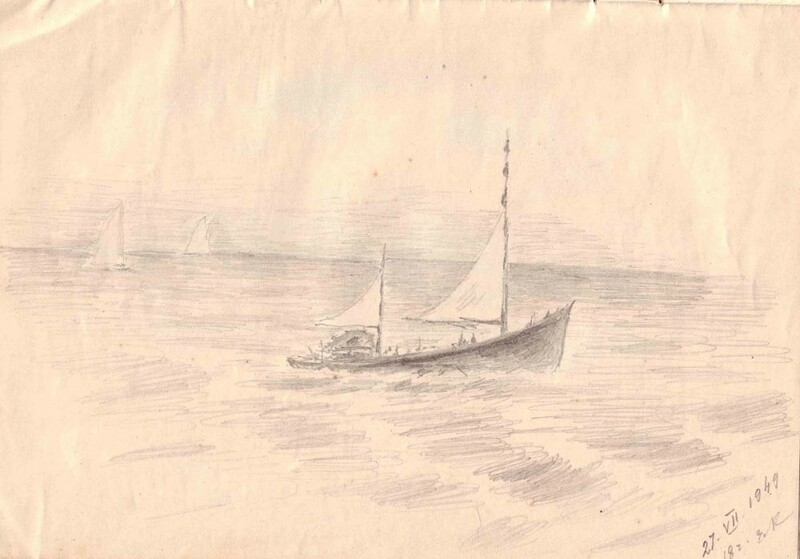 Helen and Mike Lahuta came to the U.S. a month later, on the next voyage of the General Muir. By that time we had moved to a small house over the hill from the Drobecks. We often walked over a hilly cow pasture to the farm house just to visit, or play card games in the evening, or play their piano - we found a music teacher who swapped our farm eggs and lawn mowing services for music instruction for Vladimir and me. Helen and Mike lived with us for a short time in the small house until Mike got a job on a nearby farm, at which time they moved to a small house there. This was a happy time for us. Gertrude and Otto Drobeck became our mentors in all matters. 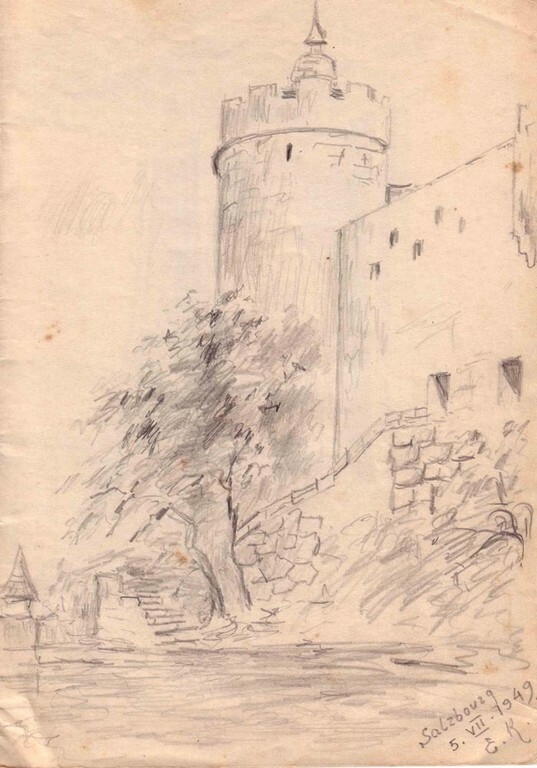 Not long after our arrival, Mrs. D. told me that she would not speak German with me anymore. She said, with her broad German a's, "Nahtahliah, you must learn English - soon you 'vill' be going to school!" Sure enough, some weeks later, a yellow school bus scooped us up and delivered us to the Newark school on Academy Street. Several years later, Mr. D. left Chambers' Rocks Farm to manage a farm near Chesapeake City, Maryland for one of the du Pont family members or high level executive. The new manager of Chambers' Rocks Farm, Bill Folwell, the owners' son, asked us to move into the big house vacated by the Drobecks. I grew very fond of this big farm house not only because we were so warmly welcomed there, but because it was the first time in our lives that we were secure and felt a sense of order in our lives. I go through its rooms in my mind still and feel comfort in remembering each room and the beautiful location the house occupied on the hillside, reigning over a valley. I used to drive by it when we were in Newark for a visit. (To my regret, the house was razed some 10-15 years ago.) Helen and Mike moved in with us when Mike left the farm he was working on, bought himself a car, and got a job as a welder in Wilmington. There was plenty of room for everyone. We lived in this house until 1954. Michael Peter Lahuta was born while his parents lived with us on Chambers' Rocks Farm. This was the beginning of our life in the United States.